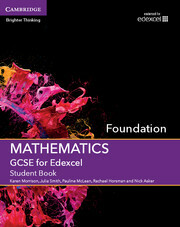 Created for the Edexcel GCSE Mathematics Higher tier specification for first teaching from 2015, this print Student Book and digital bundle provides full coverage of the new GCSE Mathematics qualification. With a strong focus on developing problem-solving skills, reasoning and fluency it helps students understand concepts, apply techniques, solve problems, reason, interpret and communicate mathematically. Tablet-friendly rich digital content features a range of interactive walkthroughs, animations and questions. Comprehensive provision for both summative and formative assessment includes differentiated pre-set quizzes and a test generator that allows teachers to compile their own assessments, both with inbuilt reporting to track students’ progression. 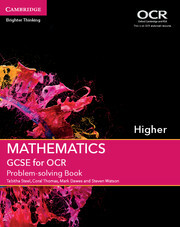 A strong focus on the development of mathematical reasoning, problem-solving skills and fluency, so students can become confident and competent mathematicians. 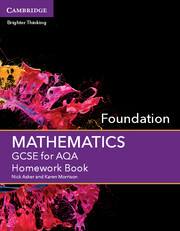 Includes a ‘Launchpad’ feature at the beginning of each chapter, directing students to their best starting point to optimise progress and allow for both independent and personalised learning. Topics and problems are introduced through a wide variety of contexts, drawing out the relevance of mathematics to the real world and engaging students. Answers to all questions are available for free on the Cambridge University Press UK Schools website. GCSE Mathematics Online can be used on tablets, including iPads and covers both Foundation and Higher, offering flexibility for moving students between tiers. 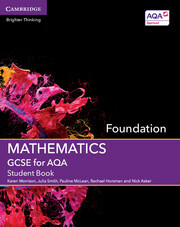 GCSE Mathematics Online includes material for all types of classroom set-up, including material for interactive whiteboards and projectors. 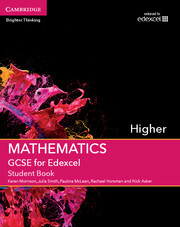 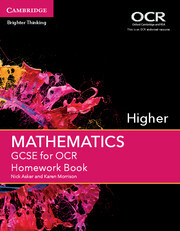 GCSE Mathematics Online includes a digital version of both the Foundation and Higher Student Books. GCSE Mathematics Online allows teachers to set tasks, create tests, auto-mark and compile reports to review student performance. GCSE Mathematics Online includes explanatory notes for every topic in the Student Books and worksheets offering practical activities, discussion points, investigations, games and further practice. 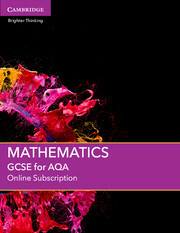 Enhanced digital features within GCSE Mathematics Online include interactive widgets to visually demonstrate concepts, walkthroughs that take students through a question step-by-step with feedback, quick-fire quizzes with leader boards providing an opportunity for question practice and levelled questions that assess understanding of each topic. Pauline worked at Norfolk LA as a Mathematics Adviser and has been a mathematics teacher for over 20 years. She worked for Capitas school improvement service, is Ofsted trained and is keen on developing maths pedagogies. 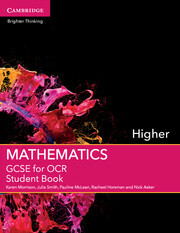 Julia Smith is Editor of the NCETM Secondary magazine and is an NCETM PD Lead. Julia is a Subject Secondary Lead for Mathematics for Suffolk/Norfolk ITT, a teacher trainer with ACER and is an outstanding classroom practitioner with management experience within secondary and FE. Awarded the Goldsmith's Award in 2013, Julia has worked as Mathematics Portal manager with the Open University, is a specialist in Functional Maths and has authored a number of secondary and FE titles.